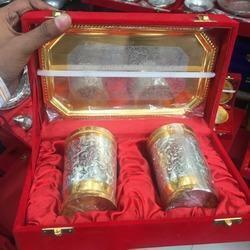 DST International manufactures and export all types of Gold Plated Wine Glass, Leaf Shape Gold Plated Plate With Spoon, Elegant Golden Glasses With Tray, New Design Silver Plated Glass, Gold Plated Antique Bowl Set With Tray. 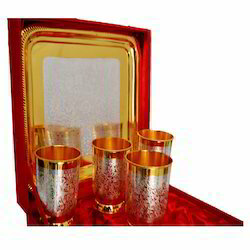 Gold plated glass set in a velvet gift box. A perfect product for corporate gifting. Leveraging on our extensive market knowledge, we are providing a high quality range of Gold Plated Glass.